Is your porcelain tub dull or hard to clean? Even with everyday normal use, the original porcelain finish on your bathtub can become dull, porous, and hard to clean after 15 - 20 years. The use of abrasive cleaners, like Comet or Ajax, can even more quickly degrade the surface. Bathtubs can also be easily cracked or chipped, making them in great need of porcelain tub refinishing. 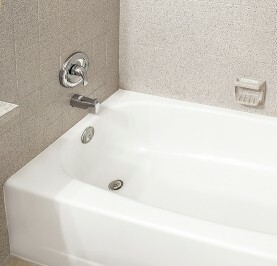 Do you want to replace or restore your tub? 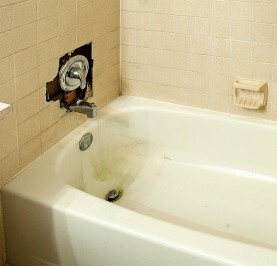 Miracle Method can provide porcelain bathtub repair to beautifully restore and repair porcelain bathtubs. Our process can even change the color of your tub to compliment any decorating plan. Choosing to refinish your bathtub, instead of replacing it, can save you up to 75% of the costs. According to the National Kitchen and Bath Association, the average bathtub replacement can cost $3000 or more when all costs are considered! Miracle Method brought this porcelain tub back to life! We repaired and refinished the tile surround too! Through the porcelain bathtub repair process, Miracle Method will not only save you money, but also your pitted, porous, chipped, and impossible-to-clean bathtubs can be made to look and feel like new, often in just one day! Think about that... in just a day, our porcelain tub refinishing professionals can extend the life of your porcelain bathtub for 10 - 15 years without the mess and cost of replacement! We can also repair porcelain sinks through our porcelain sink refinishing process. What are the advantages of porcelain tub refinishing? Miracle Method's refinishing process is so good that 9 out of 10 people can't tell any difference between a new porcelain tub and a refinished tub! Our finishes are incredibly durable and come in a variety of colors and textures to meet any decorating plan. You can be sure your refinished surface will last because only Miracle Method is the only company that uses MM-4, a non-acid bonding agent that chemically bonds the new surface to your tub. It’s why Miracle Method can offer a 5-year warranty against failure of adhesion on its bathtubs. Affordable - Much cheaper than replacement. Quick - Typically only a day or two to complete the job. Hassle Free - No dusty demolition or construction mess. - Customizable - Custom colors available. Fresh - Like-new look and feel. Extended life - Adds 10 - 15 years or more. If you are considering replacing your porcelain bathtub, click on Find a Location or call our toll free locator number, 1-888-271-7690 to reach the nearest Miracle Method professional.